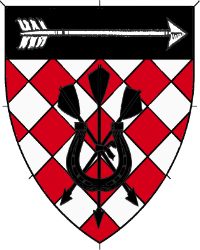 Lozengy argent and gules, a sheaf of arrows surmounted in base by a horseshoe inverted, on a chief sable an arrow argent. Name registered with the College of Arms in April 2012. Device registered with the College of Arms in November 2016.